Everyone has a learning style, and determining how your baby prefers to learn will help you give them a head start in life. Consider, for example, how useful it would have been during your early childhood to know the best way for you to learn and retain new information. If your parents had been armed with this knowledge, it would have been much easier to teach you everything from the basic colors to the ABCs. Instead of watching your baby struggle to learn as they get older, you can take the time now to figure out their learning style and begin adapting to it. What are the Three Learning Styles? Although some people learn best by using a combination of the following list, the majority of us will strongly identify with just one learning style. Unfortunately, there has never been enough of an emphasis placed on determining the learning style of any age group, so it is common for most people to have no idea how to figure out the best way to help their baby learn. By interacting with your baby, however, you should be able to ascertain which of the three learning styles works best for them. If your baby is a visual learner, they will concentrate most of their attention on watching other people do things. For example, if you are singing a song to them, they will watch your lips move in an effort to figure out how you are making each distinct sound. You can also use educational tools such as the Baby Einstein series to cultivate their visual style. This learning style will continue to evolve as the child gets older, and visual learners will typically spend a lot of time reading. For an auditory learner to truly grasp new information, it is necessary for them to hear it. In other words, a baby who learns through listening will not be as adept at learning something new by simply watching other people do it. Instead, they will need to see and hear the process. 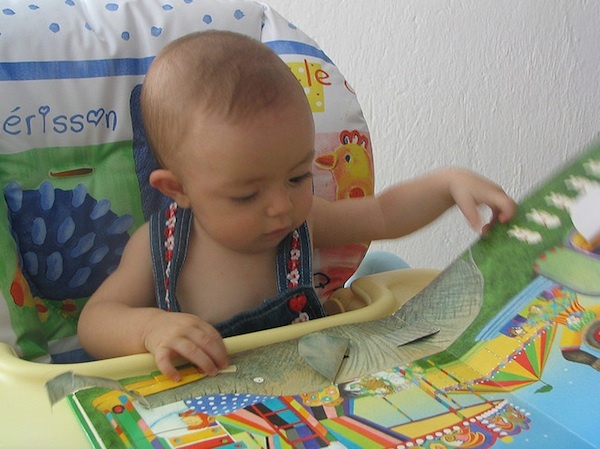 This can be complicated for babies because they do not understand most words, but as they get older, it will become much easier for them to learn. All babies rely on their sense of touch to help them learn about the basics of life, but some children will continue to need to physically interact with new things. For example, a toddler who has the physical learning style would need to see, hear and touch the letters of the alphabet in order for it to sink more quickly. If they were an auditory or visual learner instead, they would not need physical interaction. To determine your baby’s learning style, you should incorporate as much art, music and color into their life as possible. Not only will this help keep their attention, but it will also make it clear which style works best for them. After all, an auditory learner will respond better to music, but a visual learner would be more captivated by bright colors. Everyone wants their baby to have an advantage in life. Through experimentation with the three styles and careful observation, you will be able to figure out the best way to help them learn in the future. You will also be able to pass on this information to each of their future teachers to ensure that they receive the best education possible. Assisting with her nephews education inspires freelance writer, Nadine Swayne, to offer this article. As a parent, taking the necessary steps to enrich your child’s learning style will enable you to teach them new concepts at a young age. Whether you choose the physical learning style or use visual products like those from the Baby Einstein line, parents have many different educational tools that will cultivate their child’s education. It is wonderful to watch a baby learn new things. It is magical. I wish I had an article like this to refer to when my daughter was a baby! It’s amazing how fast babies pick up on learning. Every movement, color, sound and interaction counts! Thanks! My daughter is definitely a visual learner. My son was definatley physical!! This is a great thing to know early on, it can really help later on when they are in school. It would be interesting to see if you can really determine it longterm. You can. 🙂 We studied this in my education classes. Your learning style stays with you through life. It will be interesting to see what my kids’ styles turn out to be. I’m auditory while Hubs is visual. This is so useful for my girls. Even though they’re young, I can definitely see their learning styles emerging. It wasn’t until we had a kind of test for my daughter at around 10 to find her learning styles. I wish I knew what to look for when she was younger to better cultivate her strong points and curb the way we interacted with her. Thanks for these great tips. I’m pretty sure my little guy is a visual learner. Pretty cool that you can figure out your babies learning style, I thought you could only do that when they were older. This is a great post! My son is very much a mix of visual and auditory. This is so interesting. Thanks for the info. I have a little one on the way.